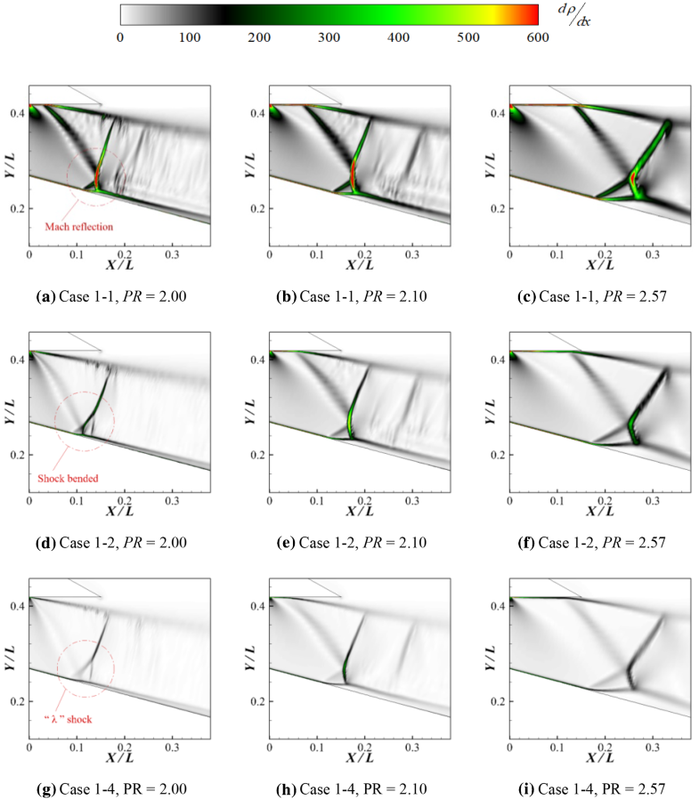 In the present study, asymmetric supersonic expansion flow produced by an annular conical supersonic nozzle has been studied under static conditions. To understand the details of Reynolds number influence on the backpressure-induced shock–boundary layer interaction, a computational program has been carried out. Particular attention has been paid to the shock physics and characteristics of shock–shock and shock–boundary layer interaction change in the flow field when applied to engines operating in different ambient pressure environments. 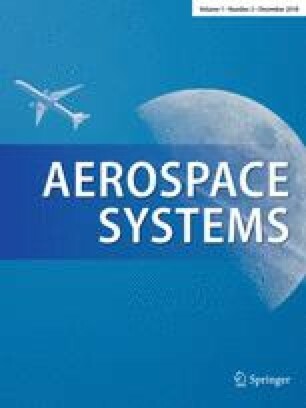 The identification of this Reynolds number correlated flow behavior changes is important for low supersonic expansion flow in engines, as it is directly attributed to the limits of off-design capability on launcher performance. The obtained results show that Reynolds number has significant influence on flow pattern at low pressure ratio, PR, conditions. When PR grows from 2.00 to 2.10, the most prominent phenomenon is that the separation point on the upper wall keeps moving downstream while the one on the lower wall keeps still. This special flow pattern results in a gradual transition from a Mach reflection to the regular reflection. However, for results at higher pressure ratios than 2.57, the comparison between the predicted shock patterns at the three ambient conditions shows a close one for these higher PR regimes. This suggests that the Reynolds number effect is going to weaken at a higher Mach number flow regime when the flow Reynolds number increases with an increase of the pressure ratio as well as the expansion flow Mach number. Flow separation in supersonic convergent–divergent nozzles is a basic fluid-dynamics phenomenon that occurs at a certain nozzle pressure ratio, resulting in the presence of shock waves and shock–boundary layer interaction inside the nozzle. Today, with the renewed interest in supersonic flights and space vehicles, the subject has become increasingly important, especially for aerospace applications for rockets, missiles, supersonic aircrafts, etc. There has been a widespread desire to investigate features with shock–boundary layer interaction in highly over-expanded rocket nozzles flow since these interactions are responsible for acoustic, vibration–acoustic, thermal, and mechanical-induced loads that act on the structure. In the recent past, a renewed interest in aerospike nozzle flow fields has been generated for both rocket as well as aeronautic applications [1, 2, 3, 4, 5]. However, while flow separation in over-expansion planar or bell ideal and optimized contour nozzles has been widely investigated to elucidate the phenomenon of boundary layer separation and shock interactions, asymmetric expanding flow in aerospike nozzles has received little attention in the frame of this study. In recent years, several experimental and numerical studies on dual-bell nozzles and traditional Laval-type nozzles have provided insight into the flow separation behaviors under different flow conditions. Previous works have shown that the flow Reynolds number can have considerable effect on the nozzle flow behavior. For example, computational studies on dual-bell nozzles [6, 7, 8, 9, 10] have indicated that there is an appreciable effect of nozzle Reynolds number on both the transition time and the dimension of the inflection region that, therefore, does not scale only with the nozzle dimension. Farther parametric studies on this issue [6, 7] have quantified its significant role on the strength of side loads that may occur during the separated flow operating condition and, in particular, during the transition phase. On the other hand, Stark and Wagner  dedicated their study to the truncated ideal contour, TIC nozzles; the authors proposed that a flow phenomenon can be observed for very low nozzle pressure ratios that a boundary layer relaminarization and subsequent transition from laminar to turbulent flow separation can occur, and this is shown to create the potential for a tilted Mach disk that directs flow towards the wall and causes large side loads. Verma and Haidn  conducted an experimental investigation to study the changes in the exhaust flow development of a thrust-optimized parabola, TOP nozzle when it is tested in two different test environments, namely under sea-level conditions and in a low-pressure environment inside a high-altitude test facility. Significant variations in results including the incipient separation and normal shock locations, flow separation regime transitions behavior have been reported and analyzed. However, most of the studies on this issue were focused on the physical phenomenon, and the relevant aspect of Reynolds number effects has been addressed until more recently. To elucidate the distinct scaling effects observed in the dual-bell nozzles, Verma et al. experimentally investigated the Reynolds number influence on the transition behavior for tests inside a high-altitude simulation chamber, and significant finds were summarized. 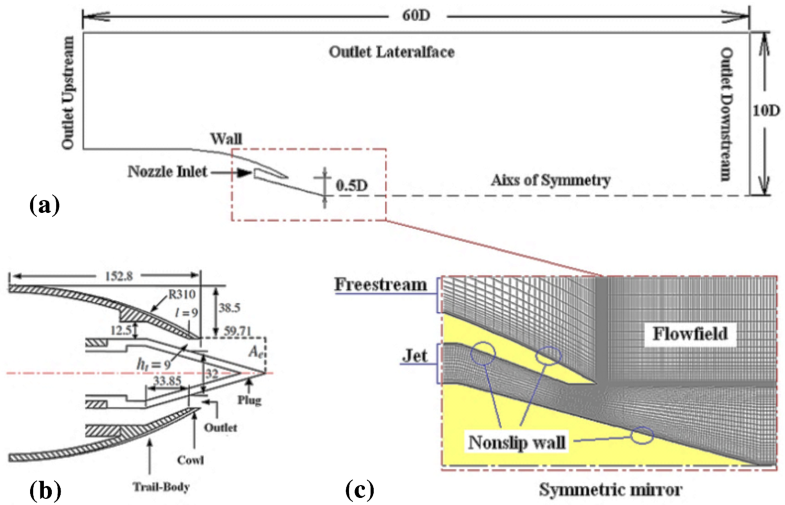 In the framework of this study, asymmetric flow separation behavior as well as shock instability in over-expanded planar supersonic nozzles has also received some attention. Olson and Lele  conducted large eddy simulations on shock wave-induced separation in an over-expanded planar nozzle, the effect of Reynolds number on the shock instability was discussed from LES data. It was reported that a reduction in Reynolds number causes a shift upward in the shock oscillation amplitude; the mean location of the shock wave was also altered when the Reynolds number was reduced. Similar observations of Zaman et al. support this dependence on Reynolds number and the incoming boundary layer. More recently, Verma and Manisankar  proposed an explanation of the mechanisms that lead to the origin of flow asymmetry in over-expanded planar nozzles, especially at low nozzle pressure ratios. For low PR or nozzle flow Reynolds number operation, the state of boundary layer is in the laminar or transitional range. Therefore, depending upon the local flow condition, the flow can experience either an early separation or a delayed separation resulting in either a free shock separation or a restricted shock separation condition, respectively. This local phenomenon can initiate the beginning of flow asymmetry in nozzles at low PR. Earlier studies [17, 18] have also shown that the state of the boundary layer, i.e., whether the boundary layer is laminar or turbulent, largely determines the configuration of shock wave–boundary layer interaction and the upstream influence of the shock wave on the boundary layer. In the present study, asymmetric supersonic expansion flow produced by an annular conical supersonic nozzle has been studied under static conditions. To understand the details of Reynolds number influence on the backpressure-induced shock–boundary layer interaction, a computational program has been carried out. Particular attention has been paid to the shock physics and characteristics of shock–shock and shock–boundary layer interaction change in the supersonic asymmetric expansion flow field when applied to engines operating in different ambient pressure environments. The asymmetric supersonic expansion flow was produced by a 15° half-angle annular conical aerospike nozzle model with a design Mach number of 2.0 tested by Verma . The salient features relevant to this study are shown in Fig. 1b, the nozzle exit radius re is 25 mm, the annular gap at the throat section ht is 9 mm, and the length of the spike L is 59.71 mm. The aerospike nozzle area is defined as the ratio of the area at the spike end to the annular throat area. The length of the cowl, measured as the distance from the throat section to the cowl lip, l is fixed as 9.0 mm, resulting in an area ratio of the inner nozzle εi = 1.19. In the present case, a modified experimental annular conical aerospike nozzle model is used, resulting in an annular axisymmetric nozzle configuration, where the flow phenomenon of primary interests takes place. The modified section to house the plug nozzle is not included in the axisymmetric computations; this strut is unlikely to have major effect on the nozzle flow field as it is located in the upstream subsonic convergent section of the nozzle. A straight annular tube similar to the one in the experiments is utilized in the present numerical model to provide an area-constant expansion region until the subsonic streams reach the beginning of the nozzle convergence. The numerical study has been conducted using a finite-volume unsteady RANS solver. The two-equation SST model of Menter  was used here to describe the turbulence. Computational results have been compared against the experimental data , it was shown that the SST model provides a reasonable prediction of flow separation just downstream of the shock caused by shock–boundary layer interaction inside the nozzle and, therefore, the best capture of the shock location and pressure distribution. In present study, all computations are made using the axisymmetric assumption with a primary motive of a fast and efficient means of obtaining insight into the relevant shock structure and flow separation behavior at various operating conditions. Figure 1c shows the geometry and detailed grid distribution in the nozzle region where the flow phenomena of primary interest take place. The computational domain includes the domain inside the nozzle and an ambient region around the outer surface. The domain extends 15 nozzle exit diameters upstream from the throat, more than 40 downstream, and 10 in the direction perpendicular to the axis. In terms of grid structure, multi-block-structured grids have been used in this calculation. Only every second grid line in each direction is displayed for clarity. For the nozzle region, grid density is higher in the divergent part of the nozzle to improve the resolution for capturing shocks. In addition, the grid is clustered along the cowl and spike walls to resolve the boundary layers, for a Reynolds number based on an order of 106, and the first grid point from either the spike or the cowl wall gives a y + < 1. A detailed discussion of the grid convergence study is reported in the next section. Fixed total conditions have been employed for the outer face boundary, outlet upstream, outlet lateral face, and outlet downstream; the total pressure is set to the ambient pressure, and the boundary condition is designed in such a way that the supersonic plume may go out of the boundary, while the ambient air may come into the boundary due to the possible plume entrainment effect. The total pressure and the total temperature at the nozzle inlet are specified to be PON = PR × Pb and TON = Tb, respectively. For all cases, the stagnation and the ambient temperature in the computations are fixed as 300 K, and pure gaseous nitrogen is simulated as the nozzle jet while a perfect gas with the properties of air is treated as the ambient fluid. A no-slip, adiabatic condition is specified for the solid walls, and a symmetric condition is imposed on the nozzle axis line. In addition, the upstream turbulence intensity is prescribed at the nozzle inlet boundary based on the located hydraulic diameter. The pressure of each case is selected as follows: sea-level pressure is set as the base value and named as Case 1-1. The pressure of other cases are gained by multiplying the base value with 1/2, 1/4, 1/6, 1/8 and 1/10 individually, and are named as Case 1-2, Case 1-4, …, Case 1-10. In each case, flow fields with PR from 1.60 to 9.87 are calculated. The simulation conditions are given in Table 1. For a given nozzle pressure ratio, the inlet total pressure decreases proportionally with the ambient pressure. The results indicate that when the ambient pressure decreases to 25% of the sea-level pressure, the Reynolds number at the initial separation point on the spike wall fell to 106, which is in the range of boundary layer transition regime. Ambient conditions and case no. To establish the fidelity of the numerical database, we conducted a grid convergence study on the nozzle, and a series of three computational meshes were run. In the experiments, when increasing the PR values, the internal nozzle operates from over-expanded to the under-expanded condition, three types of flow separation patterns can be observed at PR of 2.10, 2.57 and 3.82, respectively . The comparisons in this section are all for the above three PR conditions. The pressure distributions along the nozzle spike and cowl wall are also compared for the three meshes. Figure 2 shows wall pressure profiles normalized by ambient pressure, Pa, at the three specific PRs. Again, the plots are really similar for the three meshes, but a slight shift is observed between the coarse grid and the two finer grids. In addition, it is shown that the results for the medium and fine meshes collapse almost perfectly. However, the so-called fine grid mesh was used in the present study, as the shock pattern captured is more elaborate as the grid is refined in the nozzle flow region, especially in highly over-expanded condition when more complex shock–boundary layer interaction is to occur. Figure 3 presents three typical shock wave patterns that correspond to the ambient pressure of Case 1-1, Case 1-2 and Case 1-4. As for lower Reynolds number cases, since their flow field characters are similar to Case 1-4, these cases would not be discussed in detail due to the space limitation. The shock wave, boundary layer and shear flow in the graphs are discriminated by density gradient. Same density gradient ranges are adopted in the cloud graphs. By comparing the computation results of same PR and different ambient pressure, it can tell that the density gradient decreases with the dropping ambient pressure and inlet total pressure, and leads to the weakening of gas compression and shock wave strength. First, focus on (a), (d) and (g) in Fig. 3. Graph (a) shows that under sea-level condition, the separation pattern and flow field characters are as follows: on the spike wall side, the normal shock wave is bent by the separation shock wave of the upper wall, and begins to evolve towards Mach shock wave reflection pattern; on the inner nozzle upper wall side, the increasing of inlet total pressure pushes the separation point out across the inflection at throat, and it to the upper wall of the inner nozzle, shaping a free shock wave separation pattern. In high-attitude simulation cases as shown in graphs (d) and (g), the shock wave pattern in the extension phase of the nozzle are significantly changed along with the decreasing ambient pressure: on the upper wall, separation point is pushed back to the throat inflection point. Besides, during the increase of ambient pressure from 25% of sea level to 50%, the separation point keeps wandering near the inflection, which is very similar to the separation point’s behavior in dual-bell nozzle. It seems that at higher attitude, higher pressure ratio is required to push the separation point away from the inflection point. Besides, when the shock wave weakens, the shock wave angle will decrease with the dropping ambient pressure, which pushes the point where the separation shock acts on the spike wall upstream. On the spike side, the Mach shock wave reflection pattern transitions gradually into single λ shock wave. The separation shock wave can only affect the upstream branch of the λ shock. The extension and compression wave system behind the main flow zone Mach disk weaken gradually. In Case 1-4, the plume extension and compression wave system can hardly be seen. The change of the flow field pattern characters indicates that under low pressure ratio, Reynolds number can have a significant impaction on the shock wave-induced separation in such an expansion flow field. Figure 3b, e and h shows flow field with PR = 2.10. Compared with flow field of PR = 2.00, it shows that the decrease of Reynolds number did not induce substantial change of the shock pattern. With the ambient pressure decrease, the shock wave strength becomes weak. The most significant change is that the separation point on the upper wall moved upstream, while the separation point on the spike wall keeps still. Affected by the two factors above, the shock pattern transitioned gradually from a Mach reflection to regular reflection. The results with PR = 2.57 are presented in Fig. 3c, f and i. Compared with PR = 2.10, it can be found that the position change of upper wall separation point caused by ambient pressure decreasing becomes smaller with the increasing nozzle pressure ratio. This phenomenon indicates that in the present pressure ratio range (or if the flow inside nozzle is over-expanded), the effect of Reynolds number decreasing on shock pattern tends to be weaken gradually. Earlier experimental studies have shown that the state of the boundary layer (i.e., whether the boundary layer is laminar or turbulent) largely determines the configuration of shock–boundary layer interaction and the upstream influence of the shock wave on the boundary layer . Based on results from experimental studies on tubes with collars, it has been predicted [17, 18] that the dimensionless pressure rise across the shock wave required for separation of the boundary layer can be represented by a curve that varies as 1.4Rex-0.5 for laminar boundary layers and as 4.5Rex-0.2 for turbulent boundary layers. Here, Rex represents the general length Reynolds number at any streamwise × location. Normally, the transition range lies between a Rex of 0.8 × 106 and 3.0 × 106. Verma et al. used this coefficient to explain the Reynolds number effect during separation mode transition in dual-bell nozzle. 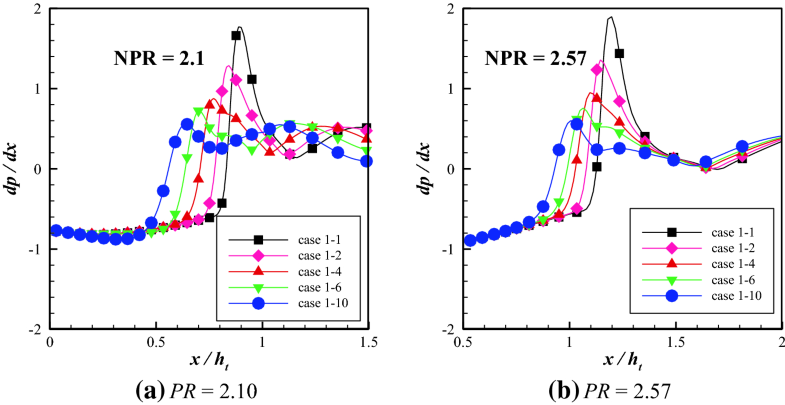 The relationship between Reynolds number and pressure rise before and after the separation shock has been analyzed in a similar way in this paper. As shown in Fig. 4, the non-dimensional pressure rise coefficient’s change trend along with the Reynolds number under the two typical pressure ratios of 2.10 and 2.57. As seen in figures, all the Reynolds number are in the range of 105–106. The Reynolds number increases with the pressure ratio. Both graphs (a) and (b) show a similar feature, that under given pressure ratio, with ambient pressure decreasing, the Reynolds number shifts from 106 to 105 gradually. The non-dimensional pressure rise coefficient becomes smaller and smaller, while the shock–boundary layer interaction transits from turbulent to laminar type. To get a better understand of the mechanism behind the observed discrepancies, Fig. 5 makes a comparison of the wall pressure gradient near the separation shock region for the three ambient conditions at pressure ratios of 2.10 and 2.57. Here the wall pressure gradient, dp/dx, is non-dimensional (the static wall pressure, Pw, is non-dimensionalized with respect to the ambient pressure, Pb) and the X co-ordinate is normalized by the annular gap at the throat section ht. The separation point locates between x/ht of 0.5 and 1.0 and 1.0 and 1.5 for the pressure ratios of 2.10 and 2.57, respectively. It can be seen that approximately similar values of dp/dx are being experienced outside the separation region irrespective of the simulated Reynolds number. However, as the ambient pressure increases, the value of dp/dx shows a decrease with a decrease in gas density or Reynolds number across the separation shock. Studies on bell-type nozzles have also indicated that a distinct excursion of the incipient separation point occurs when the adverse pressure gradient across the separation shock is smaller. This suggests that dp/dx is larger for higher gas density or Reynolds number and vice versa, indicating a stronger shock system for higher density flow. For the range of ambient pressures considered, the Reynolds number is seen to gradually decrease from a relatively high value of 106 toward 105. The non-dimensional pressure rise coefficient becomes smaller and smaller, while the shock–boundary layer interaction transits from turbulent to laminar type. Reynolds number has significant influence on flow pattern at low-pressure ratio conditions. When the pressure ratio increases from 2.00 to 2.10, the most prominent phenomenon is that the separation point on the upper wall keeps moving downstream while the one on the lower wall keeps still. This special flow pattern results in a gradual transition from a Mach reflection to the regular reflection. However, for results at higher pressure ratios than 2.57, the comparison between the predicted shock patterns at the three ambient conditions shows a close one for these higher PR regimes. This suggests that the Reynolds number effect is going to weaken at a higher Mach number flow regime when the flow Reynolds number increases with an increase of the pressure ratio. We wish to acknowledge the support of the NSFC Project (91441205). Besides, the authors would like to thank the Center for High Performance Computing of SJTU for providing the supercomputer π to support this research.